For this year's family reunion raffle, I'm making a set of cards like this. Just a generic "thank you" card. 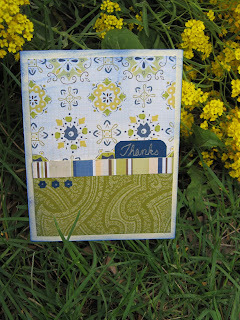 Blue Tab-To make the blue tab on this card, I cut out a small rectangle and then used a rounded corner punch on two of the corners.